Amazing Ice Melting Blocks, Thermodynamics / Thermal Energy: Educational Innovations, Inc. Totally Awesome to Watch!!! This is one of the most striking science demonstrations we have seen in a long time. Place an ice cube on each of these two identical looking black blocks at room temperature. One ice cube instantly begins to melt and is totally gone in about 90 seconds while the other ice cube shows no evidence of melting. 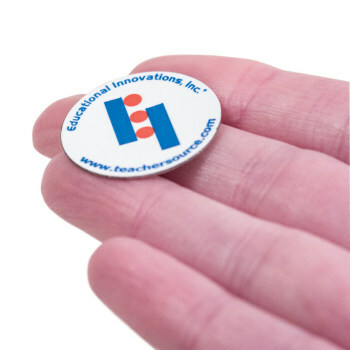 Great for showing the difference in heat conductivity in different materials. This demo is simple enough for elementary students, yet also challenges high school and university level students. A truly beautiful demonstration! Invented by retired teacher Jim Housley. Set of two blocks. 9.5 x 9.5 cm (3.75" x 3.75") each. We have used the melting blocks as part of our instructional program here at Duke. The demonstration has also been a main staple of our chemistry outreach program to show the role energy plays in the melting process and how different materials conduct heat differently depending on the nature of the material. We have used this demonstration as part of our "States of Matter" presentation for second grade students and as part of our "Chemistry and Energy" presentation for 6th grade and higher. As you well know, energy is absorbed by the ice as it melts. 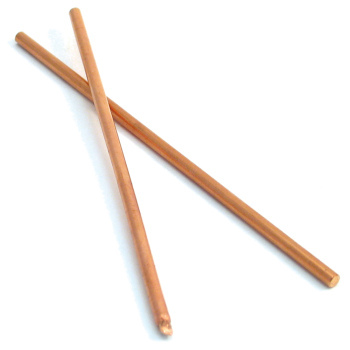 The air is a poor conductor of heat because the air particles can only transfer heat when the collide with the ice. The metal block (aluminum I think) is an excellent conductor of heat due to the electrons being relative free to transfer energy (sea of electrons). The other block (a foam plastic?) is a poor conductor due to electrons not free to move about and there are many air holes, which are poor conductors as well. Upon a closer examination, the melting occurs on the surface of the ice, not internally. In fact the internal temperature of the ice is below its freezing point; something I never before considered until I was at the National Science & Engineering Festival where a block of ice from a glacier was displayed in one if the booths. The ice had liquid water on its surface due to melting but the internal temperature was well below 0 C enabling the block to remain solid for many, many weeks. This is why they were able to transport the ice by ship, train, and truck to the festival without it melting completely. This is also how ice was transported from cold areas where ice was formed or existed to warmer areas before freezers were invented. I found that the melting blocks, simple as they seem, can be used to bring out a large number of chemical concepts as well as historical concepts about the melting of ice. Great activity! It was a fantastic mind-boggler for my 8th grade students' introduction to the use of the scientific method! Love it! Lead to great discussions. Never disappointed in your products or service. Those books are a great demonstration. The kids (and you) won't believe their eyes as it takes seconds for the ice to melt on the metal block. Really a must have! I was surprised on how fast the ice melted on the fast melting plate. I was thinking it would take a while but you can present this complete in about 15 minutes. Wow! Stage worthy. I use this on day 2 in my honors and ap chem courses. In honors I ask then to predict on which block ice melts faster. Intriguing. In ap, since they have already done it, I monitor the temps of the block as ice melts using vernier temp probes. I was able to use these at a teacher training and fell in love with them. I can't wait to use them in my classroom. Very exciting demonstration. Used in many year levels-conduction and chemical bonding. Tremendous illustration of melting and heat energy. Great illustration of principles of insulators and conductors. Great Wow! factor for students, especially since their predictions are wrong. Leads to good discussion. This simple demonstration of materials' different heat conductivities can't be beat. That the behavior of the ice on the blocks is counter intuitive adds to the WOW factor. But, once explained makes perfect sense. This demo works as well with college seniors enrolled in a biophysical chemistry course for students from life sciences as it does in K-12 classrooms. Every year the students are mystified by the ice melting blocks. I use the blocks as a whole class demonstration. I pass the blocks around to all of the students. The students write their predictions. As they observe the results, their interest in the topic soars. As we progress through the unit on heat transfer, the students continually try to figure out how the ice melting blocks work. My students are amazed to see 2 exact blocks melt ice at different rates. A great way to introduce heat transfer! I like using the Amazing Ice Melting Blocks to get my 5th graders to make observations through what they see, smell, and touch. Once they have written down what they have observed I ask them which block will make the ice cube melt faster. The students share their ideas and then write down their predictions. I absolutely love to watch their faces as the ice cubes begin to melt and they immediately begin to draw their conclusions on what is happening. Great product and fun activity! I love this simple product.I bring a few ice cube to class in a thermos. I set the blocks out for about a half hour to let the students see that they are both at room temperature. When we begin our discussion about thermal conductivity I bring out the ice cubes. I use these with students when teaching observations and inferences, and physical properties. Students assume the blocks are identical until the ice is placed on them. It is interesting to listen to them when they try to figure out why the ice behaves differently. I would highly recommend these! This demonstration was a big hit with my chemistry class, they really had to work to figure out why one melted so much faster than the other, allowed for a discussion of materials and heat conductivity. This was the highlight of our 1st-3rd grade class science fair! Kids and parents were amazed! The physics were easy for the kids to understand and explain. These amazing ice melting are just that - amazing!! My students were in awe and couldn't believe the results. With my elementary students I used them to explain the scientific method and how the results might not always be what you predict - and how scientist face that with each experiment they perform. With my high school students it's a great demo on the Law of Conservation! These were wonderful to use to catch the attention of the class at the start of a lesson on thermal properties of different materials. I had students predict what they thought would happen first. Great fun! I use this demo during my class discussion on states of matter and thermal interactions between the system and the surroundings. I have the students make observations and draw conclusions quietly and independently and then open it up to class discussion. Very much worth the money... Used every year with great sucess. Buy for class demo or for each child. I used these with my 6th graders and my college students. I love the ice melting blocks. I use them from conceptual all the way to advanced classes to talk about heat transfer and specific heat. This is a great way to introduce heat transfer and conductors/insulators. Its an inexpensive way to wow your students. This is an awesome demonstration. I love the hypothesis that the students come up with to explain why the plates melt the ice at different rates. Really gets them thinking. The ice melting blocks amaze all levels of students and create some great discussions about heat transfer! This is a great demonstration. Your students will be fascinated with this. This demo was quick and easy and really blew my kids minds. It really helped to get the conductivity of heat concept across to my students. Extremely effective demonstration of thermal conductivity in different material. 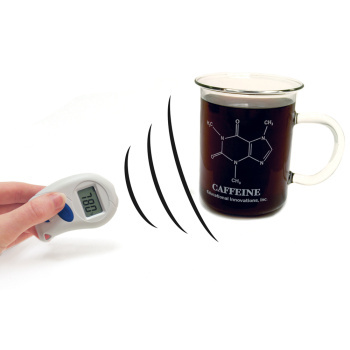 Also great to use in showing the difference between temperature versus conductivity. Easy to use and students love the surprising (to them) result! These blocks are amazing and work, great demonstration and the students, even high school students are amazed!! These blocks are my absolute favorite thermal energy demonstration (and it ranks in the top 5 of my overall favorite demos). My students are blown away after they predict that the ice will melt on the warmer block, yet as soon as the ice cubes are placed on each block, the aluminum block melts the ice cube immediately while the ice cube on the plastic (warmer) block barely drips! All I can say is WOW!! Students can use the Amazing Ice Melting Blocks to plan and conduct an investigation to describe and classify different kinds of materials by their observable properties. Students can use the Amazing Ice Melting Blocks to make observations to provide evidence that energy can be transferred from place to place by heat currents. Using the Amazing Ice Melting Blocks, students can develop models to describe the atomic composition of simple molecules and their structures or properties. Students can use the Amazing Ice Melting Blocks to apply scientific principles to design, construct, and test a device that either minimizes or maximizes thermal energy transfer. Students can use the Amazing Ice Melting Blocks to plan an investigation to determine the relationships among the energy transferred, the type of matter, the mass, and the change in the average kinetic energy of the particles as measured by the temperature of the sample. 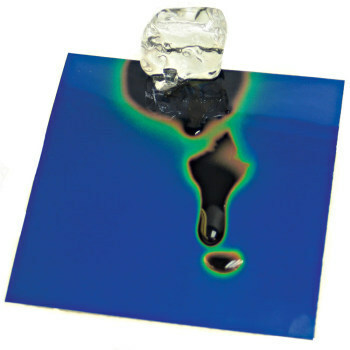 Students can use the Amazing Ice Melting Blocks to plan and conduct an investigation to provide evidence that the transfer of thermal energy when two components of different temperature are combined within a closed system results in a more uniform energy distribution among the components in the system (second law of thermodynamics). The temperature is a measure of the average kinetic energy of particles of matter. The Amazing Ice Melting Blocks creates a dilemma for students to solve when two similar looking materials have different effects on ice. 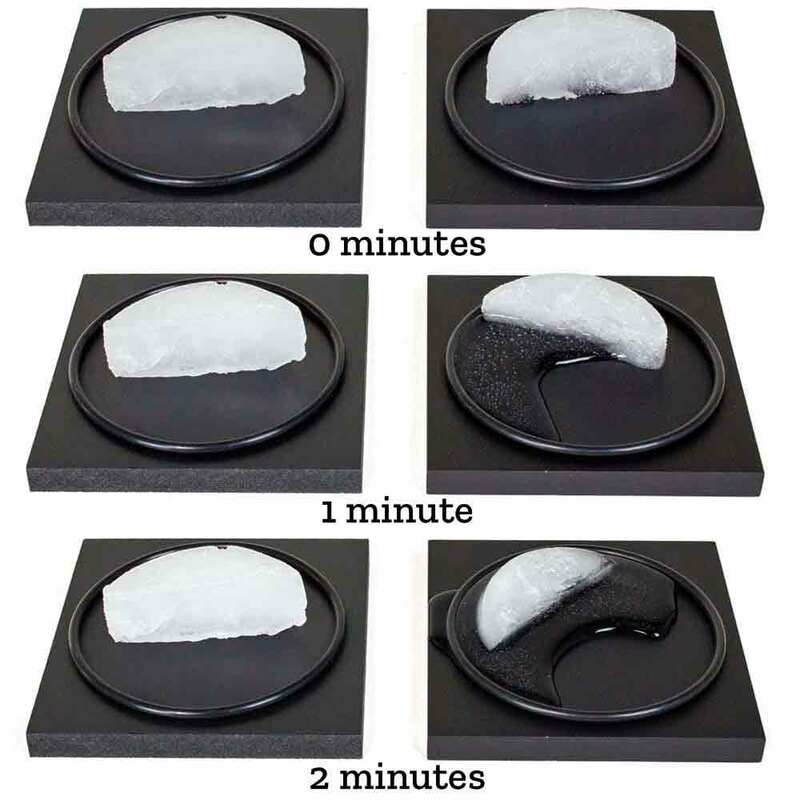 The Amazing Ice Melting Blocks create a dilemma for students to solve when two similar looking materials have very different effects on ice. When students place identical amounts of ice on the Amazing Ice Melting Blocks, their observations will provide evidence and help them to understand that energy can be transferred. Using the Amazing Ice Melting Blocks students can develop models to describe the atomic composition of the two different blocks..
Students can use the Amazing Ice Melting Blocks to plan an investigation to determine the relationships among the energy transferred, the type of matter. When students place identical amounts of ice on the Amazing Ice Melting Blocks, the variation time for the transfer of thermal energy is surprising, making the investigation of the second law of thermodynamics concrete.